It’s the time of tablets. Almost every mobile phone company is trying to launch its own tablet for its customers. Earlier the tablets were launched at higher cost but now the trend for cheap tablets has started. Recently Reliance 3G Tab and Beetel Magiq tablet were launched for Rs. 12,999 and 9,999 respectively. 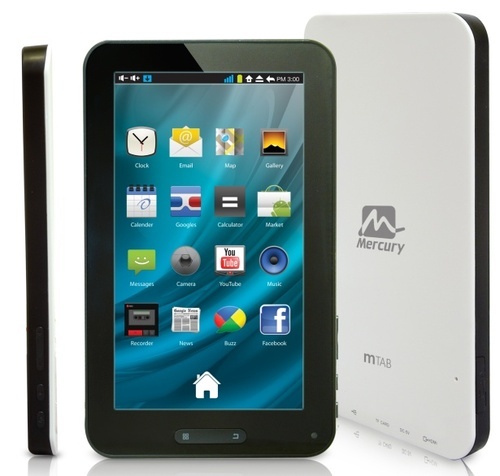 Now Mercury has also entered the tablet market with the launch of their very first tablet at just Rs. 9,499. Mercury mTab is feature rich Android tablet which is powered by 1.2 GHz triple core processor and it runs on Android 2.3 Gingerbread OS. It not only has powerful processor but it also comes with 512 MB RAM. As per its memory concerns, it provides 4 GB of internal storage which can be expanded upto 32 GB with microSD card. Its comes with 7-inch (800×480) WVGA TFT LCD display with G sensor screen rotation for 3D games. To browse the internet it supports Wi-Fi with IEEE 802.11b/g compliance. The major disadvantage of this tablet is that it do not support 3G but you can use 3G with the help of external USB dongle. Mercury mTab can also be used for video conference as it comes equipped with 1.3 Mega Pixel front camera. It weighs in at just 400 grams so we can carry it anywhere easily. What are your views about this tablet? Are you going to purchase it? Hi! Simrandeep. Your upgraded template looks very nice. im using your “WP perfect” blogger template. I want to convert the “Default search box” of the template to “Google custom search box” how to do it. Thnx for the template. Can i use my TATA Doco SIM card for use Internet and calling. is there an official website for the device?